Over the last year or so, I've re-evaluated what I want in terms of a foundation. My skin is oily in the t-zone but most matte foundations have begun looking too heavy for my taste. When Wet n Wild came out with the new Photo Focus foundation and powder, I had to grab them! The foundation is advertised as a "your skin but better" with a matte, light diffusing finish. And the powder has a soft matte finish that helps reduce shine while looking beautiful on the skin. Yes, yes, yes! 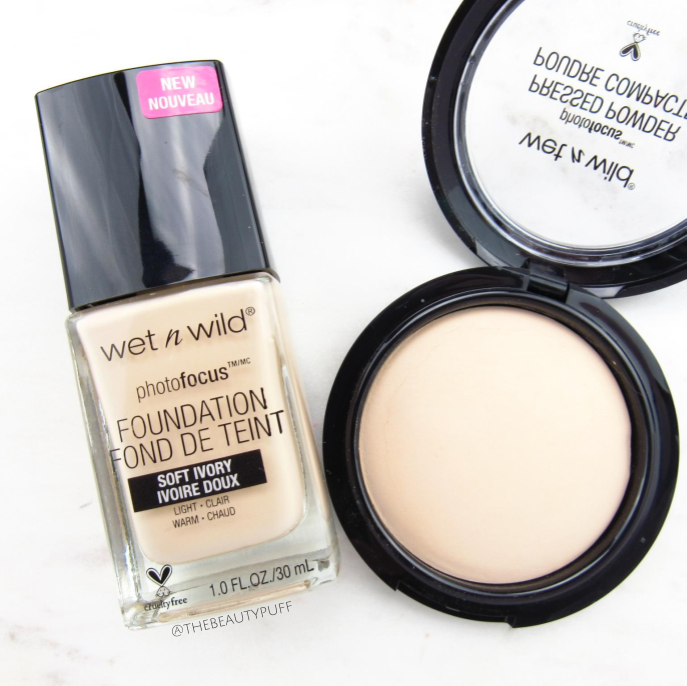 Packaging | While I favor a pump or squeeze bottle for my foundations, I have to say the Wet n Wild Photo Focus foundation comes in a pretty sleek, quality bottle. It feels more expensive than it is but I would feel fine traveling with it. The cap has a plastic spatula attached to distribute the product. I place it on the back of my hand as a more sanitary option to applying directly on my face. The powder has a somewhat flimsy cover that doesn't always stay up, but for the amazing formulation, I'll gladly look past that! Formula | The Photo Focus Foundation is thin and blends beautifully. Application is a breeze and I loved how it built on the skin without looking heavy. It gives medium coverage with a brush and I noticed absolutely no oxidation. The Photo Focus Pressed Powder is the silkiest drugstore face powder I've ever felt. It's a very finely milled formula that lays seamlessly over makeup without looking powdery. A gorgeous naturally matte finish that doesn't look like you have multiple layers of makeup on = Love. Longevity | I was really impressed with how the foundation lasted on my oily skin. My skin looked better by the end of the day than with many of my long-wearing foundations. And it actually felt better too. Since the foundation is a thinner formula, I didn't feel like I had a lot of makeup on and my skin could breathe. Final Thoughts | As you get older, your skin changes and so does your perspective on makeup. I've been craving a more natural finish on my skin without sacrificing longevity or oil control and these products have provided just that. And at $5.99 for the foundation and $4.99 for the powder, how can you go wrong?! Shop Wet n Wild on Ulta's website below.